They say your Burn begins the moment you decide to go. If that’s the case, mine started on the east coast, over brunch, only days before my departure. It – like many of mine are – was a last minute decision. My friends A&M invited me. I declined. They asked why, and I mentioned the cost being an issue. They countered with a steal of a deal. Even so, I had no sure way of getting there. Then, they offered me transportation, along with a spot inside the RV that they’d be camping in. All I had to do at this point, was say yes. So, I did. My mission was to meet with the group driving the RV. Many of them were traveling from Arizona & making a stop in LA for other virgins (fist-time burners). I spent a beautiful day in Venice Beach with my friend, Nick. It was a good feeling knowing that I was dipping in the same ocean that has entertained the likes of Jim Morrison, Evidence & Hank Moody. Our visit to the beach was only going to be a walk near the waterfront… Or so I thought. I wasn’t dressed in my swimsuit (even though it was packed in my luggage for the dessert). I wasn’t prepared to actually get in the water, which is odd for me, because I know I can never resist jumping in the waves. That afternoon, I (re)discovered that you can’t always wait until you’re fully prepared for something. I thought way too long and hard about going in the water before I finally gave in. In shorts, a tank top & a full face of make up, I made my way into the beautiful Pacific. I realized that I was only holding myself back from having fun. 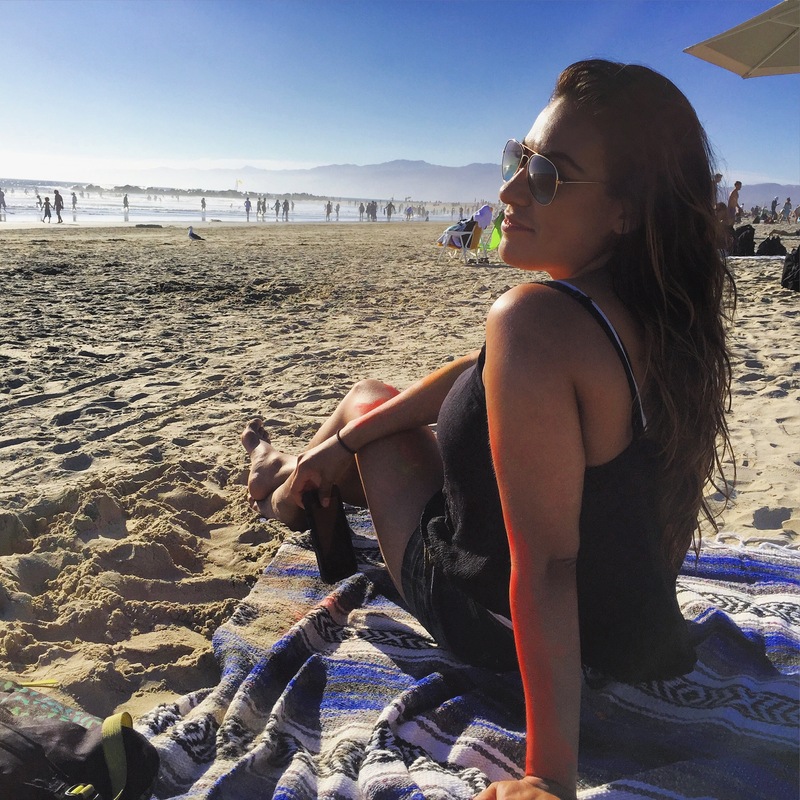 I know how much I love the ocean, and that I never pass up a good swim, but for some reason, I didn’t take my bikini to one of my favorite beaches…? That’s just insane! I had to remind myself that true happiness only comes when you’re doing what you want. It doesn’t matter what you’re wearing, or how you’re feeling, or whether or not you makeup will look a hot mess. When you get the opportunity to do something you love, you just gotta dive right in… Like right here, right now. Though I was having a magical day on the west coast, communication from the AZ bunch had ceased and I was worried. I was already nervous about this whole situation. Not hearing from them did not help. After a mini panic attack & several attempts at getting in touch with the driver, I found out that the RV was having mechanical issues. They were going to have to delay their departure until tomorrow. I decided I would make a night of it & enjoy Los Angeles. I squeezed in a bowling session with Snow Tha Product & the Woke Family. Then, I got a good night’s sleep to prepared myself for the long journey the next day. In the morning, I learned that the RV was en route, and would be arriving in the evening. I had time for one more beach visit! I got news that Snow & the Wokes were headed to Venice, so I met them there- this time equipped with my swimwear. After a fun afternoon with my friends & the waves, it was time to get on the road. When I first met Leo (the RV owner and driver) I didn’t receive the warmest welcome. Given that I was already nervous about the trip, the rocky introduction just added to my worries. But, even though I felt a bit uncomfortable, I forced myself to board the RV and go through with what I had already agreed to. *Special thanks to Nick Morgan for capturing me in my state of bliss. Your photos are such a gift! 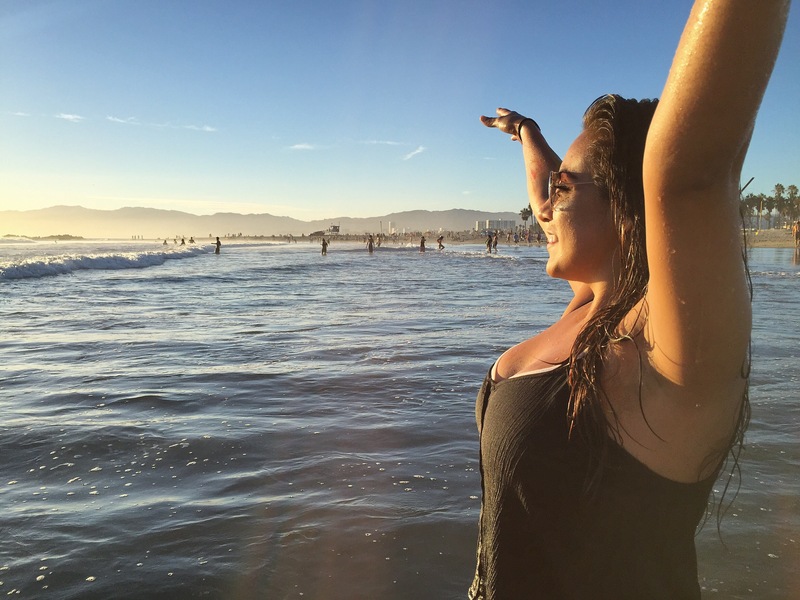 This entry was posted in travel, Uncategorized and tagged beach day, Burning Man, CA, California, travel, Venice Beach on December 7, 2015 by Cecilia S..